Related to Olympics coverage, NBC featured a story this morning, about “the knowledge,” which is the 50,000 streets and thousands of sites and restaurants, etc., that London cabbies have to learn, so they can quickly take passengers anywhere. Our cabbie in London took us quickly from Heathrow to our hotel in Victoria without a missed street. Another cabbie knew instantly how to get to John Wesley’s Chapel from Victoria (a few miles away), though he said he hadn’t been asked to for a long time. When I noted this on Facebook, a friend who had been to London twice added that the certification for London cabbies is the equivalent to a college degree, and about as expensive! I said that my family and I used to live in a community where a local landmark was “the old Sears store.” The building now contained several different shops and businesses. Nothing identified it as a former Sears place. But folks still said things like “Turn left a block past the old Sears store.” Newbies to the community, as we had been, were very confused by such directions! In the place we previously lived, I asked a church friend the location of a store, and she said, “Just to the left of old Route 21.” I figured out that she meant a certain street which had once been U.S. 21, but that highway had long since been rerouted, and nothing on the street today indicates its earlier designation. Similarly my hometown, Vandalia, Illinois. On the “Vandalia Memories” Facebook page, some of us chuckle that we still call stores by the names they had thirty or forty years ago, not out of disrespect for the current owners but from habit. A classmate has an excellent music store on the main street, but instead of calling it “The Noise” some of us forget and call it “Merriman’s” or “Bo-K,” businesses there in the 1960s and 1970s. When you move to a new community, you have to learn aspects of the place: locations of good restaurants, the nearest post office, good places to service your car, and other things. You have to learn local perception of things: which beloved sports teams are rivals, for instance. New to St. Louis, we learned that folks are interested in which high school you attended; it’s a way of connecting with people, in a way. In some communities, unfortunately, you never quite catch what makes folks tick, and you come away regretful that your life there was less positive than it could’ve been. But usually, if a community is friendly, and if you have an interest in people, you can ascertain local interests and make enjoyable connections. One thing that I love about “local knowledge,” though, is discovering those beloved places which people hold in memory. Folks were accustomed to the furniture store, the schoolhouse, or whatever the place was. Now, the store is something else, or the place is torn down, but the places remain landmarks: landmarks of the hearts, I’m tempted to say. 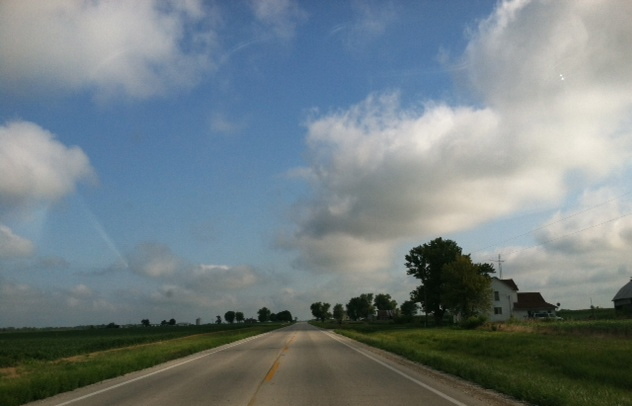 After writing about Ramsey, IL (and childhood memories) in the previous two posts, let me import these thoughts from my “Journeys Home” blog. First, let me give full credit to the photographer of these pictures. They were taken by Mr. John Kohlberg, who sells on eBay some of his railroad photographs from many midwestern communities. 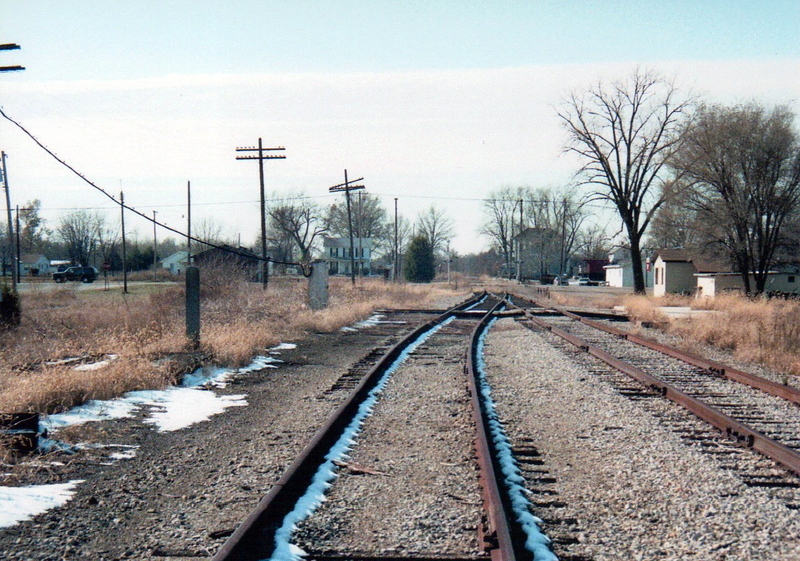 He took these photos in Ramsey, IL in November 1991. 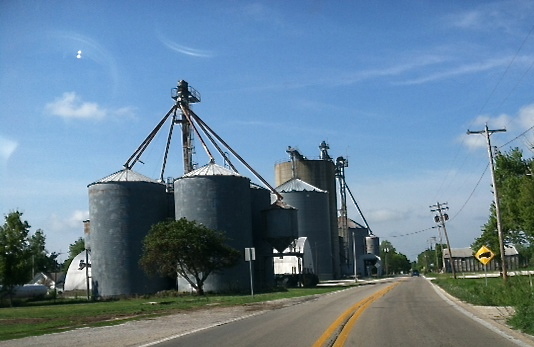 Ramsey is a small village in my native Fayette County, Illinois, north of my hometown Vandalia; my Strobel great-grandparents and four of their ten children are buried in Ramsey (though my grandfather, number eight of the ten, is buried in Vandalia). Mr. Kohlberg’s original photos are sharper and better than my scans. I received his permission to post these and so please don’t download them yourself. The photographs depict the Norfolk & Western railroad. He says that originally this was the NKP’s Cloverleaf District, St. Lous Division, 4th Subvision from Madison, IL to Charleston, IL, later acquired by the N&W. 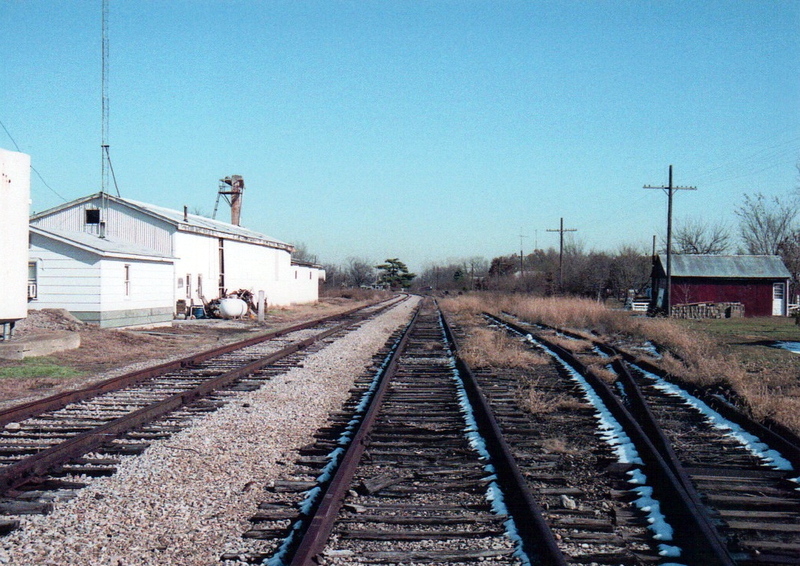 (The “Nickel Plate Road” was the New York, Chicago, and St. Louis Railroad, reporting mark NKP). 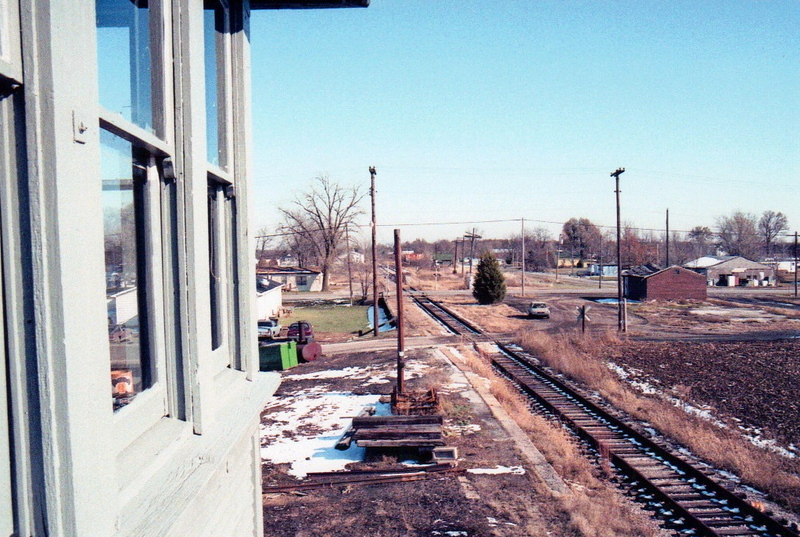 The views were taken on the west end of Ramsey, east of the Illinois Central Interlocking Tower, and also from the stairwell of that tower. The line is abandoned. I like to use eBay to find postcards and antiques related to Fayette County. Mr. Kohlberg’s photographs came up for bid as I did a “Ramsey” search. I purchased the photos not because I was familiar with those specific views (and I’ve not been to Ramsey for several years), but because that my heart was so warmed by them. 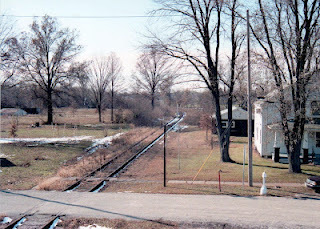 I grew up on a residential street traversed by the Illinois Central tracks. The railroad still operated when I was young; it rumbled across Fillmore Street, and sometimes you had to wait a while as it passed. The ICRR crossed Vandalia’s main street at a slight angle and sometimes halted downtown traffic as it rolled past the old debot, one of the town’s hotels, the grain elevators, and a lumber yard. The Pennsylvania Railroad also passed through Vandalia, but west and east. Those trains rushed through town much more quickly, stopping north-south traffic. I remember so many times when, as a little kid, we’d have to wait at the railroad tracks during a downtown errand, and I’d try to count the passing cars but either lose count or became motion-sick. My dad was a truck driver who hauled gasoline and fuel oil to places around southern and central Illinois. 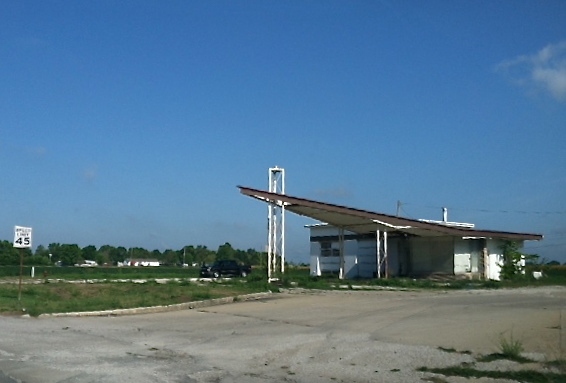 Over the years he had two places where he parked his truck, one at Fifth and Johnson Streets and the other at Sixth and Main (Main is not Vandalia’s primary thoroughfare, in spite of its name, so a large truck parked beside white storage tanks were off the principal section of the downtown). 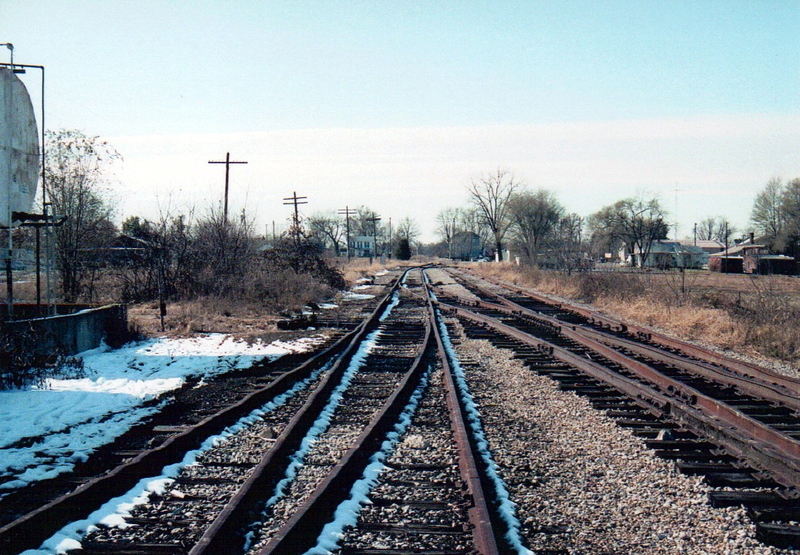 The first place was along the Illinois Central tracks, where a wooden trestle carried Johnson Street above the ICRR tracks, and the second was near the intersection of the PRR and ICRR, where both current and exempt tracks lay across a small, gravel landscape, where tenacious grassy plants nevertheless persevered. 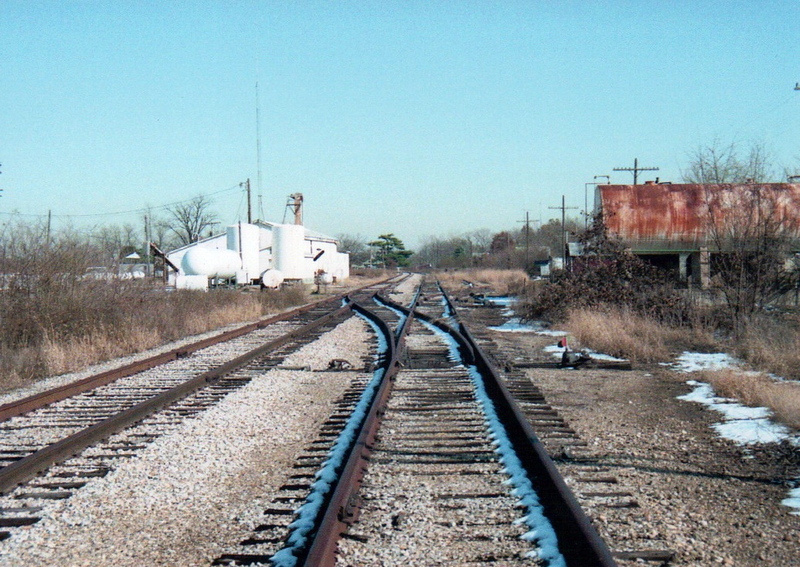 Once downtown—a kid walking on my own in our small, safe town—-I looked into the hazy, summer distance of the PRR tracks, and I sometimes became wistful and curious about the direction my life might take—as much as a young person can form such thoughts. I felt at home in our small town, but the railroads represented the world beyond our town: places to which to travel, the unknown to face as it came. The railroads also represented to me a kind of passing world because, although I’d no knowledge of the state of railroad business in America, I knew that passenger trains no longer stopped at Vandalia, and in fact such service had ceased when I was four or five years old. Vandalia had four or five hotels, though I only knew of the two that still operated as such; another had been converted to the First National Bank, and two others had long since become local businesses. I had a very basic idea that Vandalia’s hotels had once been busy, necessary places for travelers, salesmen, and the like who rode the trains. 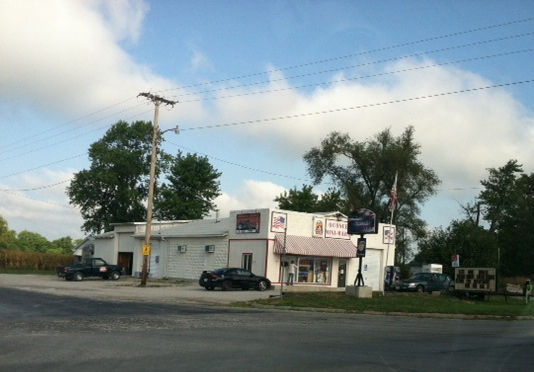 Vandalia had several bars and package stores. “Package” sounded like such a nice word, a word we used at Christmas. And although my parents didn’t drink, I eventually became nostalgic for old beer signs for Stag, Falstaff, Miller Hi-Life, and others. Somehow I associated these familiar beer signs with the railroad, not logically, but I suppose because of the ICRR to the business district. A lot of hometown landscapes and features became sentimentally mixed in my mind. I wonder: what everyday landscapes move you deeply, even though they may be very plain and, to some people, unattractive? One of my best friends, for instance, is cheered by the urban landscapes of Queens. Another loves the hilly vistas of small town Pennsylvania, where old homes perch on steep hills or stand along the very street. What sights and topographies would remain dear to your thoughts when, as Annie Dillard writes in her memoir, everything else in your mind is fading away, because you so love them? My little nostalgic journey up U.S. 51 continues, because I kept screwing up the formatting of the previous post as I tried to get the text to wrap around the photos properly, LOL. As I drove north from Ramsey, I passed through the little place called Oconee. I smiled, because I’d nearly forgot about the day, about 45 years ago, when Dad called from Oconee and said his pickup truck had caught fire! He called home, and knowing my mother was at a downtown shop, I called the business number to tell her. Life is so much easier now with cell phones. The day became an impromptu adventure as we drove to the 25 miles or so to Oconee to fetch Dad. I’m sure this little station was the same place where Dad’s truck (a ’69 but I forget the model) was parked as it awaited repair. When I was very little, we attended a family reunion at Kitchell Park in Pana, IL. I don’t remember which of our families’ met there; our reunions usually happened in Vandalia, so perhaps it was a Carson family gathering. That’s the family name of his my dad’s mother’s side of the family, including the two Decatur aunts. I played on the playground but a couple of older kids played too vigorously, I fell, and ran crying to my mother. To console me, she walked me to this 1910 bridge. I’ve always thereafter felt a fondness for ponds or streams with lilypads (like those beneath that bridge), and of course the paintings of Monet. 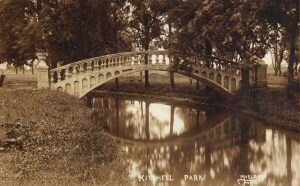 I took some pictures of the park and bridge but they couldn’t compare with this great old postcard I found on eBay a few years ago. 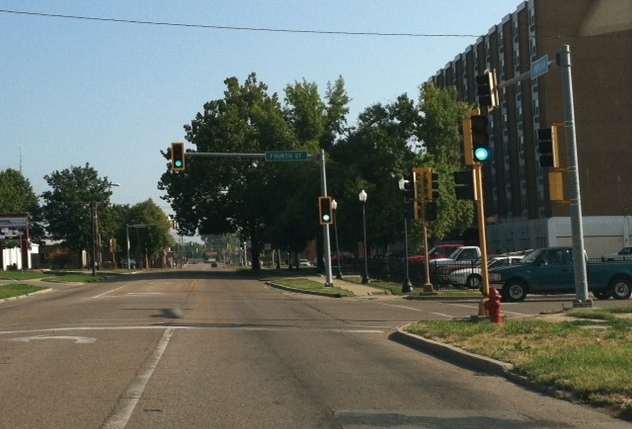 I love how two-lane roads follow the streets of towns and cities. 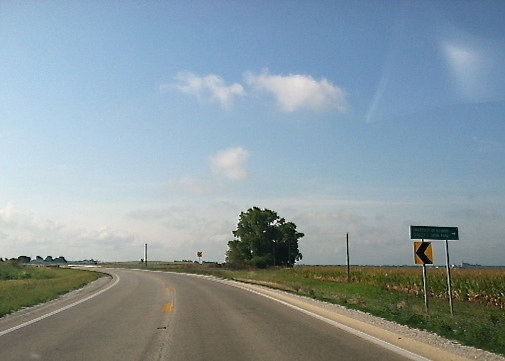 As you take U.S. 51 through Pana toward Decatur, you turn right, then left, then right again for a long stretch, and finally left again as you turn north. 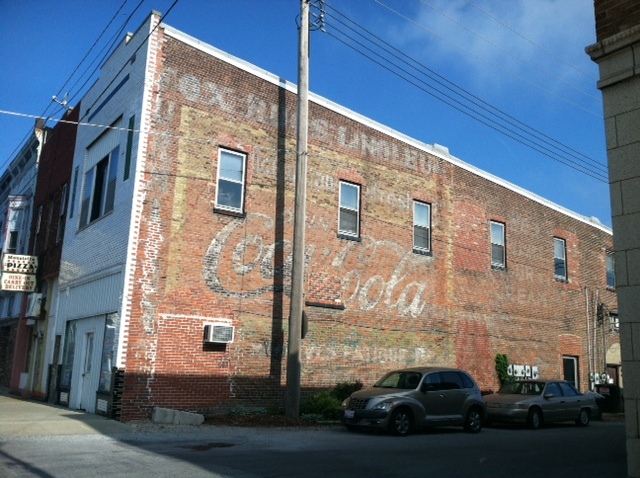 Like so many small towns, Pana’s business district is forlorn, but I did notice an awesome “ghost sign” on the side of one building (I wrote briefly about ghost signs at https://paulstroble.wordpress.com/2011/10/03/favorite-roads-iiimusical-road-trips-ii/). 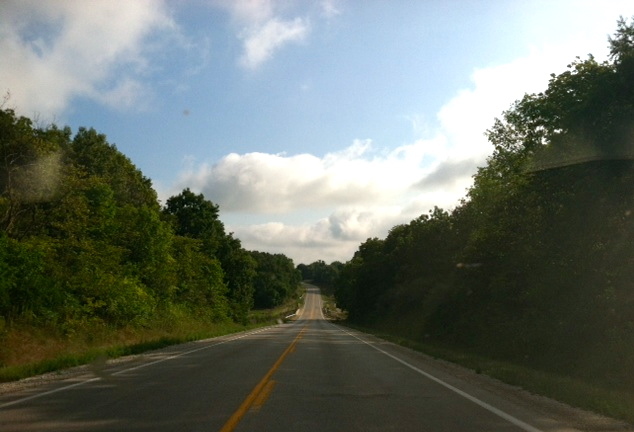 For some reason a lazy pair of curves, just north of Pana on 51, appealed to me as a kid on those Saturday drives. They’re not far south of the turnoff to the village of Dollville. They were my primary destination this trip. U.S. 51 is slowly being turned into a four-lane road (it’s been in process and under discussion for years). I wanted to revisit those curve before construction altered the landscape. When I was little, I didn’t think about why I liked those highway curves. Something about that particular landscape and the short curves in the highway made me feel peaceful. I was happy because I had a new toy to play with from our Decatur shopping time, and I watched out the car window as scenery passed by. Many years later, that landscape still warmed my heart. So it was no big deal to drive nearly 100 miles from my current home, just to see that section of highway before, eventually, it becomes upgraded to four lanes. I didn’t drive further north on U.S. 51. The pair of gentle curves was the main thing I wanted to revisit. A few miles to the north is the village of Assumption, and a little further north from Assumption is the village of Moweaqua, which I remember fondly from childhood Decatur trips because it had a wonderful restaurant along 51 through town. One day, when we’d stopped in Moweaqua, we were amused to see a small gaggle of barefooted teenage girls walking along the main street. Where were they headed? Where are they today (now in their early sixties)? 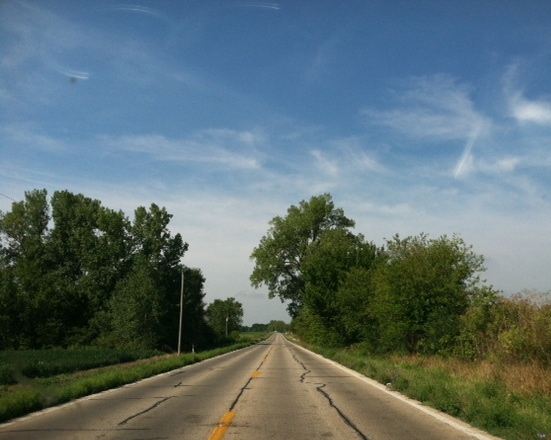 Highway 51 once passed through Moweaqua, but now the four-lane road bypasses the town, and the abandoned alignments (which you so often see at small rural towns where the highway has been modernized) approach the town in grassy places at both the north and south sides of town. 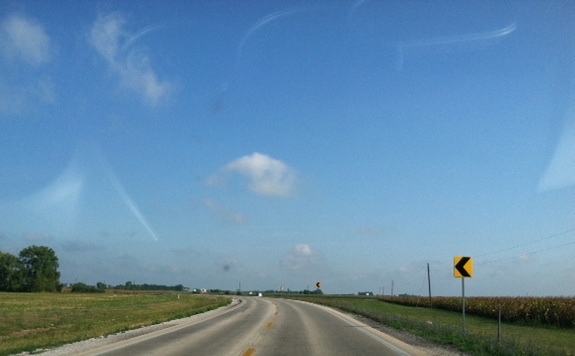 I returned home not via U.S. 51 but Illinois 16, headed west to Interstate 55. 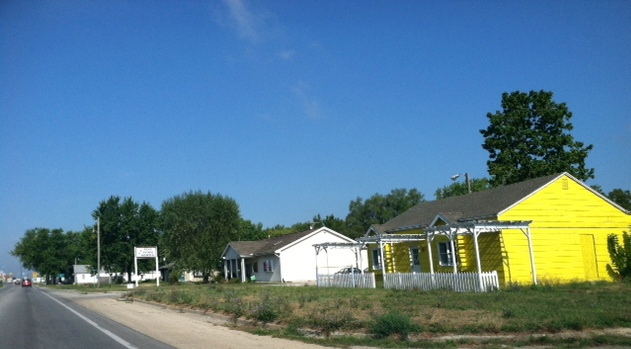 I’d once written a story about a small town along highway 16, for reasons I explain here: https://paulstroble.wordpress.com/2011/08/04/a-story-of-providence-and-community/ Such tiny little villages along 16! But if you lived here, I suppose you’d either hate it or your life functions around the small sights of the village. 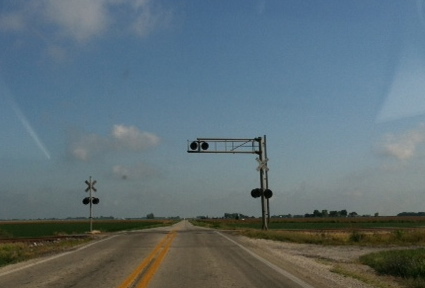 I’ve always been fond of trackside grain elevators, though; my hometown has them along the Illinois Central tracks. I took a picture of those, plus a pretty scene where the road passes through a cluster of trees. I stopped by a coffee shop along the way. I asked the barista if it was okay that I was barefooted, and she laughed and said, “As long as the state doesn’t see you.” Down old Route 66 a ways, I visited a wonderful antique mall. One of the clerks happened to be outside on cigarette break. She said it was okay that I was barefooted so I went in and padded around the numerous displays on three levels, my feet free for a pleasantly long time upon the soft carpet. An old road sign caught my attention, so I purchased it and took home an addition to my collection. Turning north off I-70 at Vandalia and driving north on Route 51, I was in the midst of traffic and thus didn’t want to take a cell phone photo of a low, wooded area on the east side of the highway and the south side of Bear Creek north of Vandalia, but that area was the place where my dad grew up, on a long vanished farm. He was born in an earlier house, on the north side of the creek. 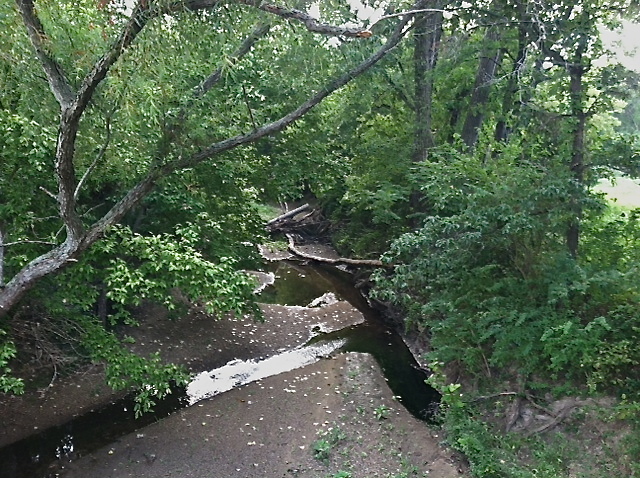 One of my earliest memories was a cross stuck in the low ground of those creek bottoms: it read GET RIGHT WITH GOD. I paused at a couple remnants of an earlier era of travel. 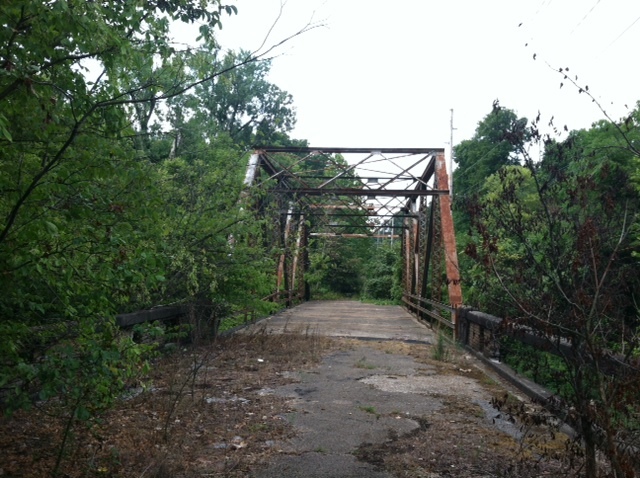 One is an old highway bridge and portion of abandoned alignment on the east side of Route 51, a few miles north of Vandalia. 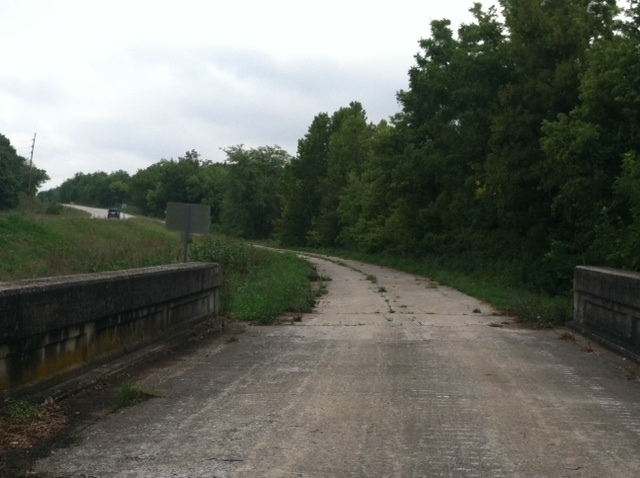 I hopped from the car, took some pictures of the bridge, the old pavement, and the surrounding countryside. 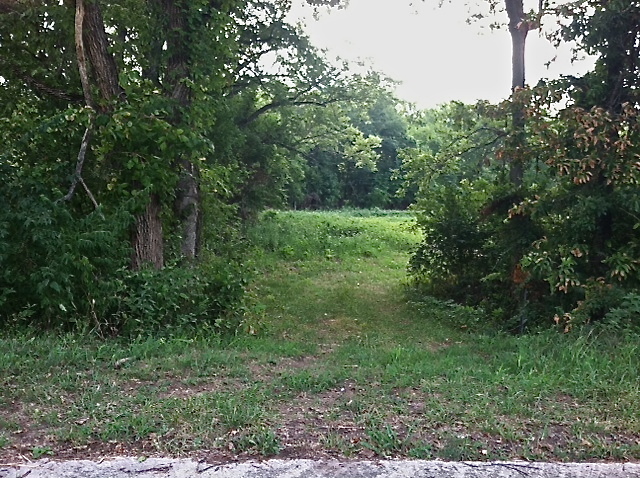 The present road is higher and to the west a few feet; I tried to imagine what the scene would look like if the old road was still current and drivers made this much wider curve across the pretty stream. 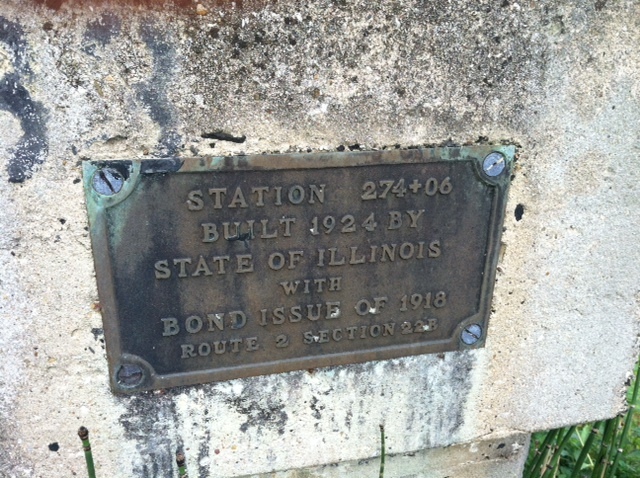 The plaque on the bridge indicates that the road had been State Bond Issue route 2 during the late 1910s and early 1920s, prior to the road’s incorporation into the U.S. highway system. 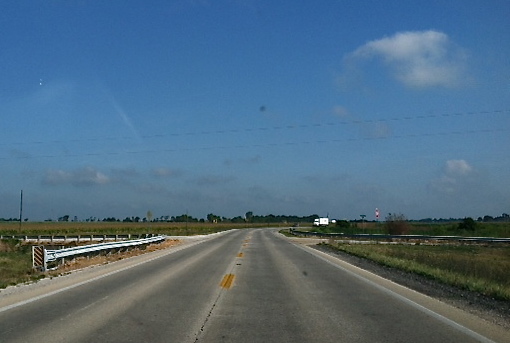 State routes 1, 3, 4, and others from that early road system still exist with those numbers, and I believe some short stretches are still signed route 2 in northern Illinois. of the bridge, and then I wrote a post about it (https://paulstroble.wordpress.com/2010/12/12/a-set-of-favorite-roads/) At that post, I remarked that the scene was haunting in its abandonment, perhaps since I took the picture in autumn. On this most recent trip, I revisited the place and and took a photo to compare with the earlier, autumn photo. 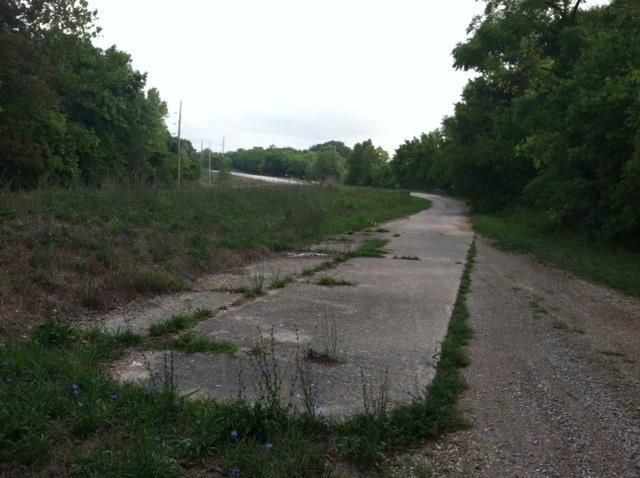 The roadbed has become much more overgrown and the scene creepier—an example of how nature reclaims abandoned human-made landscapes. But I remember the pleasantness of that shady stop on the side of the road, when stopping for a picnic lunch beside the two-lane wasn’t uncommon. 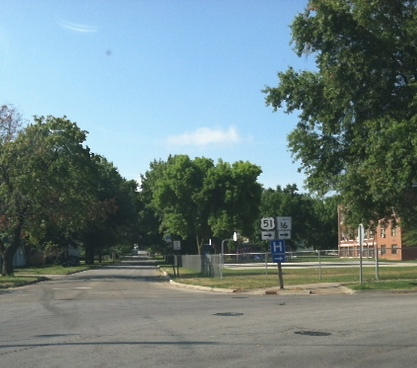 I stopped in Ramsey, IL, the small town where my great-grandparents settled in the 1880s. They’d previously lived in Madison County, IL. 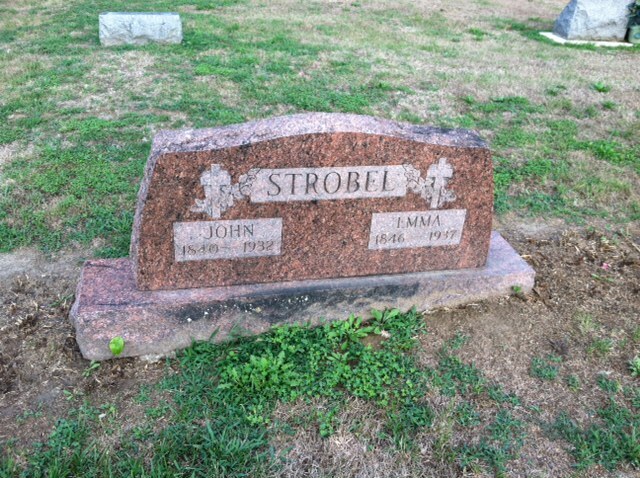 My dad remembers his grandparents fondly and was a pallbearer for John (http://paulstroble.blogspot.com/2012/05/my-civil-war-ancestor.html). I had not visited their graves since I brought Dad to the cemetery, not long before he died in 1999. 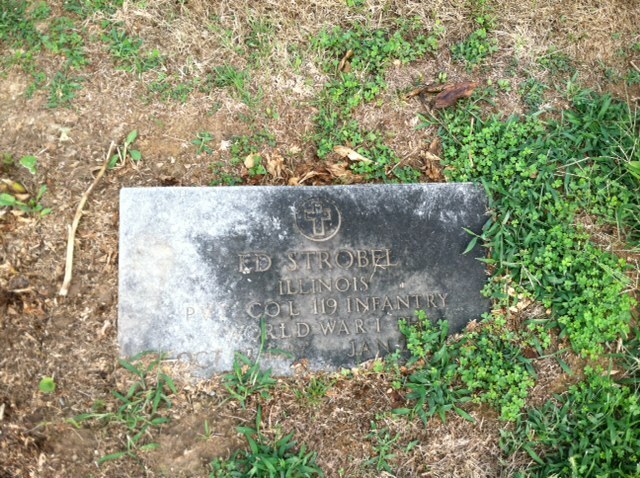 Beside my ancestors lies the tenth of their ten children, my uncle Ed Strobel (1889-1961), who served in World War I. He died when I was four, but I vaguely recall attending his visitation. He was a bachelor who raised horses; a woman on Facebook told me Ed, a very kid person she said, had let her ride some of his horses when she was a little girl in the 1950s. Back around the time I took Dad to visit his ancestors here in Ramsey, I was surprised to notice an old cut-out highway shield, once common along federal highways but replaced by square black-and-white shields beginning in the 1960s. 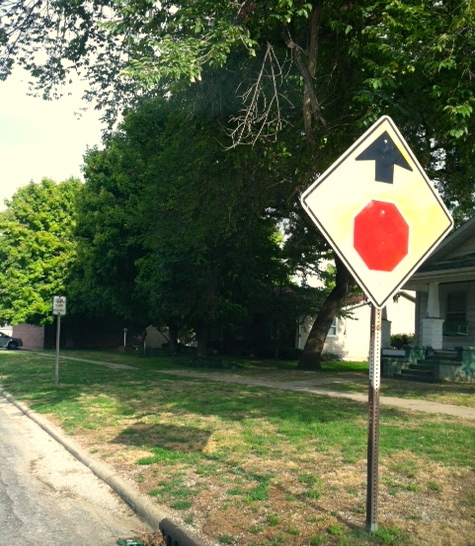 The shield, along a Ramsey side street, had probably been overlooked by highway workers who had replaced the old signs. 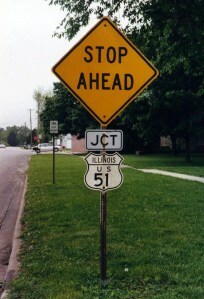 The shield has since disappeared and the “stop ahead” sign replaced, but the pole must be the same as the earlier picture, since it shows evidence of the place where the shield and “junction” sign had been.